For some time I had been thinking about building a U-2. First my interest was aimed at the prototype, but its bare metal finish and the very limited information made it a difficult project. I also liked the civilian registered CIA examples. With some Alps-printed decals I would be in business. And so I decided to do a dark blue CIA example. Finding an Academy U-2 proved to be rather difficult. It's long out of production, and not a single one could be found at various IPMS-Netherlands Nationals for example. In the end my modeling friend Eric sold me his Seminar U-2. The genesis of this kit is pretty interesting. It all started with an Airfix model issued in 1984, that allowed construction of an U-2A or D (boxs says B/D) with small inlets. The same model was issued in the USA by MPC with a few extra parts (long 'canoe' spine, larger bulged intakes, extra cooling inlet and an extra bulged Q-bay hatch), allowing a C version too. Airfix reissued the model in May 2005, now correctly listed as a U-2A/C/D, including the MPC parts. Reviews and build reports of the Airfix/MPC kit can be found on SMAKR (Derrick Winters) via the Wayback Machine, SMAKR (Mark Braithy) via the Wayback Machine, SMAKR (Kevin Ronayne) via the Wayback Machine, Datguy on ARC Forums and Modeling Madness. 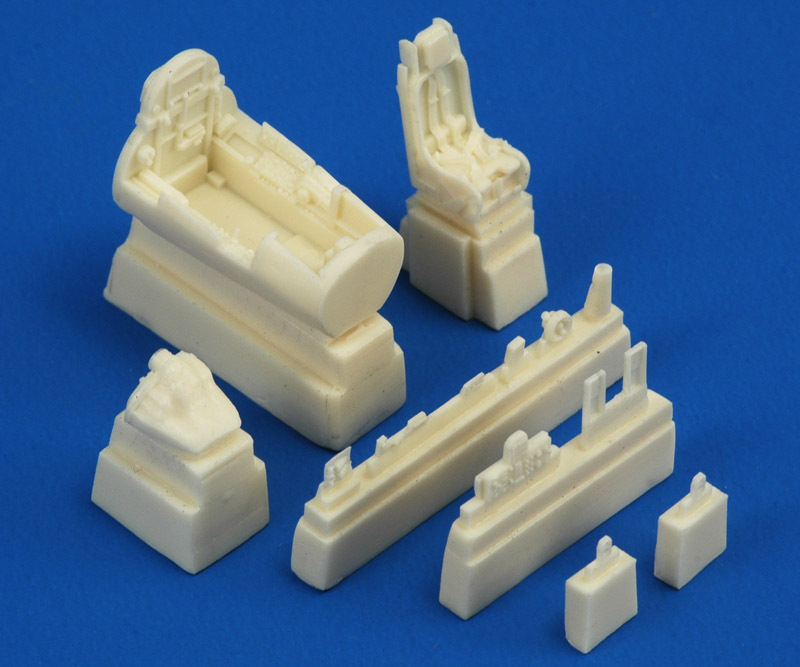 Academy copied the Airfix/MPC kit in 1987, rearranged the sprue lay-out, and gave it engraved panel lines. There are minor differences between the kits however. 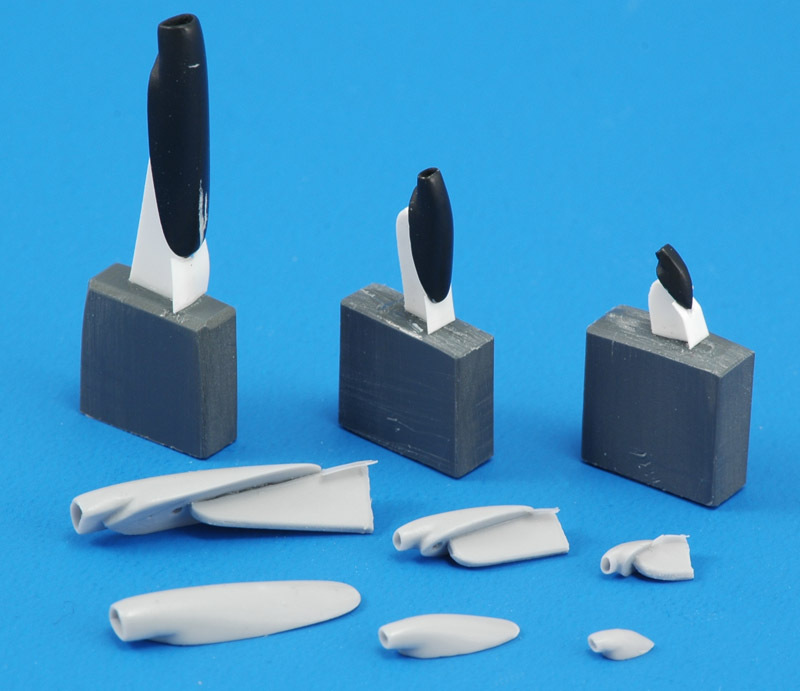 For example, the Airfix/MPC kit has a solid fin attached to the left fuselage half, whereas the Academy kit has fin halves attached to each fuselage half, Academy's pogo wheels are more detailed, and Academy's inlets are noticably narrower than the Airfix equivalents. A built-up example by Mark Davies can be seen on Hyperscale and IPMS Auckland. A very nice Academy all-black USAF U-2C can be found on Keith Goodman's website. Reportedly there is an Ace rip-off of the Academy kit, but I never saw solid evidence. Finally the Academy mould was sold to Seminar, also in Korea, who changed nothing expect they removed the Academy logo from the sprues. The earliest report of this kit that I found is from 1999. I don't think Seminar models are distributed in Europe or America. My example came via Australia. Noteworthy is that the box sides show a U-2R photo, and the box art also resembles a U-2R somewhat, especially the nose, which the artist made too long. The quality of the Academy/Seminar kit is reasonably good I think. It's a fairly simple kit, with only a few main components and not too many smaller parts. I have never read any negative comments on the shape, so it seems there are no big problems there, except the flat canopy. The panel line scribing is done nicely, and so far I haven't found obvious errors. The kit has two sets of intakes (small U-2A and bulged U-2C), two different optional spines, and optional small slipper tanks. This allows about any early U-2 version to be built. The wings show some warpage. The fuselage has a large number of sink marks. The rear half of the vertical tail is much too thick, ending in a very overscale trailing edge. I guess the original Airfix single-piece tail is better in that respect. A contrail-checking mirror is not included. Two Q-bay hatches are included: one that strangely lacks any camera openings, and a bulged one without windows as used in the UK for tests of the Advanced Location Strike System. The canopy has a strange pimple in the middle of the canopy. More serious is that the canopy is too flat. Some parts and the sprues have some flash, but nothing too serious. The decals look pretty bad. During construction I found some small errors; refer to the build report below for these. I performed some measurements of the kit's dimensions. Fuselage length between the tip of the nose and the exhaust edge should be 203.4 mm according to the fuselage station plan in the Aerofax book, and I measured around 201.5 mm. A 1% error is quite acceptable I think. The fuselage width between the flaps scaled out within 0.5 mm, pretty good too. Apart from the above four more or less identical models, there are two more early U-2s in 1/72 scale. 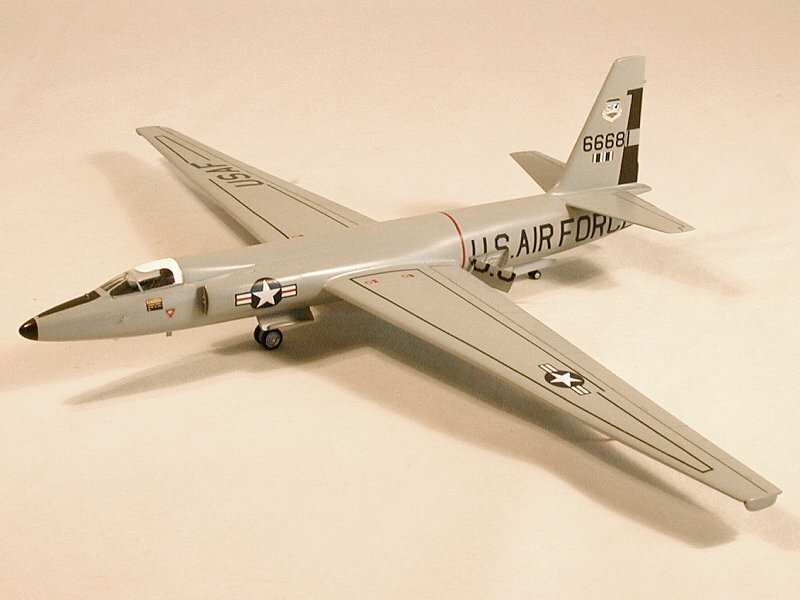 Rareplanes issued a vacform model of the U-2 in August 1979, and thus predated the Airfix model by five years. 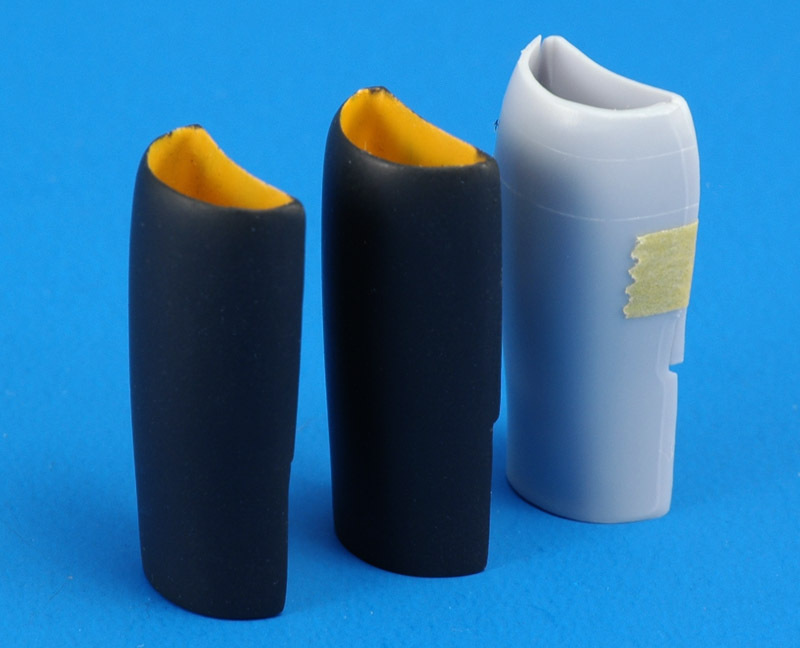 The kit is largely identical in layout, details and options to the injection moulded kits, and although it is a nice vac, it is not worth the extra work. Airmodel also made a vacformed U-2, reportedly a D, but I am not sure. Its catalog number was 152 (no longer listed on the Airmodel site), and it consisted of one sheet with fuselage halves, wing halves, and two horizontal stabilizer pieces, plus a clear vacformed canopy. No decals or small parts like the landing gear are included. Wilfried Eck of the "1. Plastikmodellbauclub Nürnberg e.V." built the Airmodel U-2. Squadron also issue the Airmodel vacform, and it seems these kits had mid gray instead of white plastic. 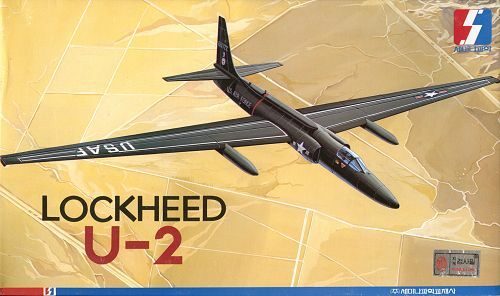 The second-generation U-2 in 1/72 scale is available from three manufacturers: Rareplanes, High Planes and Special Hobby. The Rareplanes vacform was first, issued late 1988 with white metal parts and decals. High Planes 7235 contains TR-1A and U-2R options, and was discussed by Pin on BritModeller. Special Hobby 72024 represents a TR-1A, and was built by Chris Bucholtz on Internet Modeler. Special Hobby 72070 represent a Senior Span U-2S and a NASA ER-2, and was reviewed by Mike Grant on the Roll Models site, by Carmel Attard on Modeling Madness, and by Rigid on the Airfix Tribute Forum. I knew I wanted to do a civilian-registered CIA example: I really like the contrast between the aircraft's mission and the "oh, it's only a civilian aircraft" registration. Photos of nearly every number between N800X and N809X exist. After a long study I selected N803X as the aircraft that I wanted to do. Assuming that the registration was assigned to a single airframe (which I doubt somewhat), there are some six photos of this single aircraft. 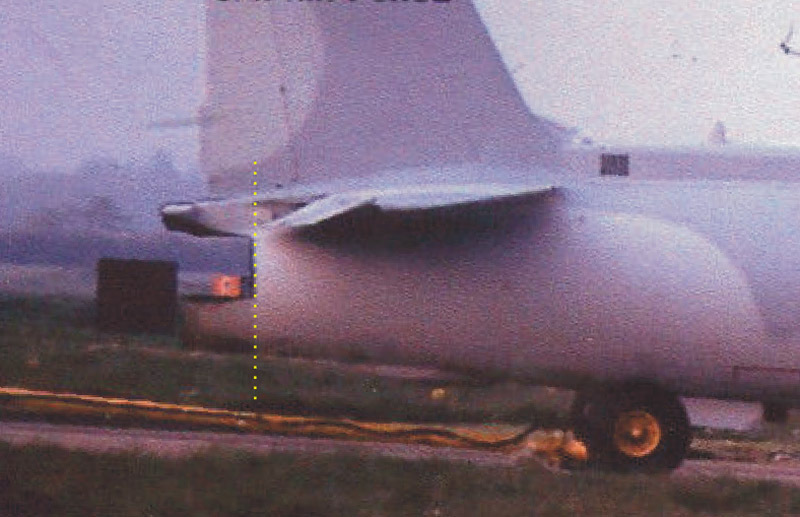 The photos appear to show one and the same aircraft, with the exception of some small underfuselage items. According to the 1983 Aerograph book, N803X was 56-6683, possibly 'Article 350', the 9th production U-2A (not counting the proto), assigned to the Agency. According to this quite detailed Pinetree Line page, Article 350 / 56-6683 / N803X was not used for East Block overflights by 'Detachment A' (Wiesbaden & Giebelstadt), but possibly it was by 'Detachment B' (Incirlik & Lahore). However, during the Cuba crisis two CIA U-2Cs were loaned to the USAF, which until then had never updated its U-2s to C standard. One of them was 56-6683, and on return from a flight over Cuba on 20 November 1963, it crashed north-west of Key West, FL. USAF Pilot Joe G. Hyde was killed. Note: the N803X registration was later used on U-2R 68-10329, during its first flight on 28 August 1967. The Seminar canopy has a strange pimple in the middle of the canopy, possibly an ejector pin? The white sun cover will hide it most likely. In reality, the sun cover is fitted inside the canopy, but painting the kit's canopy on the inside will not give the desired effect: it will emphasize the non-scale thickness of the part. The kit-supplied canopy (middle) appears to be too flat, with the windshield set at a too low angle. I decided to try to replace it with a Starfighter canopy, since the U-2 fuselage was developed from the 104 fuselage. Later I found out that the canopy is exactly the same: on page 220 of 'Remembering the Dragon Lady' it is stated that the U-2 canopy had the same part number as the F-104 canopy. I tried both the Esci (left) and Hasegawa 104 (right) canopies, and they fitted pretty nicely. Of the two canopies, I liked the Hasegawa canopy best by far. The Esci canopy is some 5-10% larger than the Hasegawa canopy and indeed oversized when compared with a 1:1 Starfighter canopy & windshield. The Hasegawa canopy almost drops in place, if I hadn't modified the model first to accept the larger Esci canopy. I had to restore the canopy sill with white plastic card. The sheet metal behind the canopy has to be made a little taller too, with a kink in the contour. Possibly one could also use the rear transparent part of the 104 canopy. The new canopy really transforms the appearance of the model: it gives the model a face instead of a non-discript transparent bump. Plus it is moulded much thinner and clearer than the original canopy. A very good upgrade of the model! A contrail checking mirror needs to added to the new canopy. I built two sets of inlets, because I initially thought N803X had U-2A inlets, and then changed my mind to the interim U-2C inlets. For reference I will report my adventures with the U-2A inlets first - they are shown on the right. In build reviews I had read about fit problems with the inlets. But no-one remarked that the Academy inlets are way too narrow, even for the small-intake U-2A version. And to compensate for the narrow inlet, the boundary layer slot is much too wide. I solved the latter problem by roughly halving the thickness of the wedge on the fuselage that creates the boundary layer slot. The inlet parts still fitted reasonably after that. 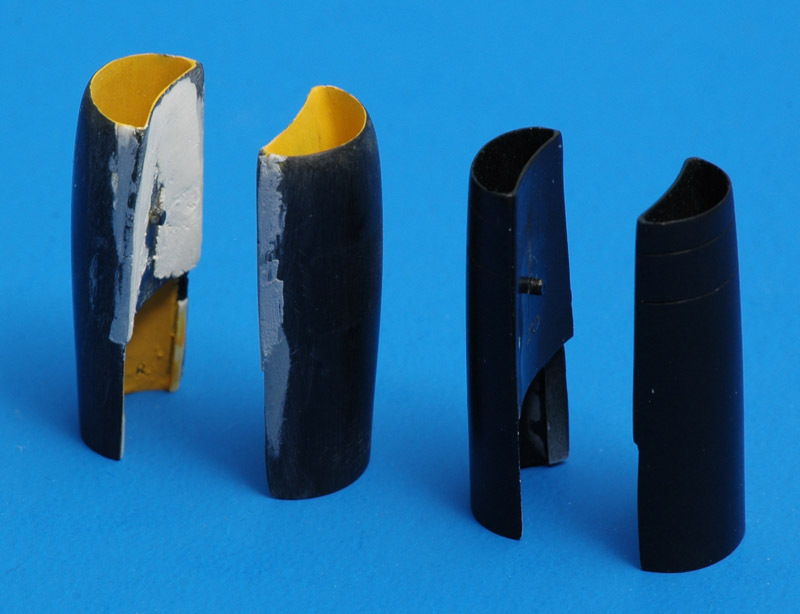 To increase the width of the inlets, I glued strips of plastic card to the outboard parts. They formed a wedge that was about 1 mm at the front. The inboard parts were also slightly modified, removing the step in the interior, about 3 millimeters behind the forward edge. Although I expected lots of problems giving the wider intake a nice curvature around the widened areas, this was quite easy. The two panel lines were rescribed and the U-2A inlets were declared ready. The photo shows the inlets after being painted satin black, so you can't see the wedges. The cross section of the inlet opening is still not completely accurate: the corners should be sharper. I don't mean the radius, but the angle at which the outboard and inboard faces meet. 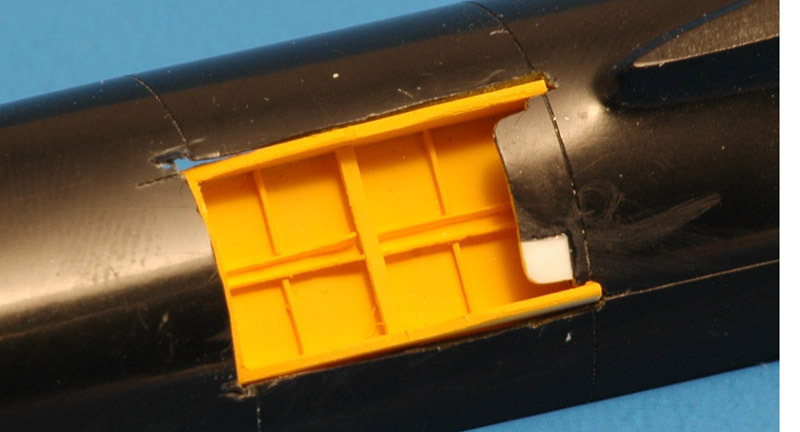 The kit's U-2C inlets have the same problem as the U-2A inlets: they are too narrow, and the bleed slot is too wide. The clearest photos of the interim U-2C inlets that I found are those of Powers U-2 wreckage on display in Moscow, and I used these as my guide. 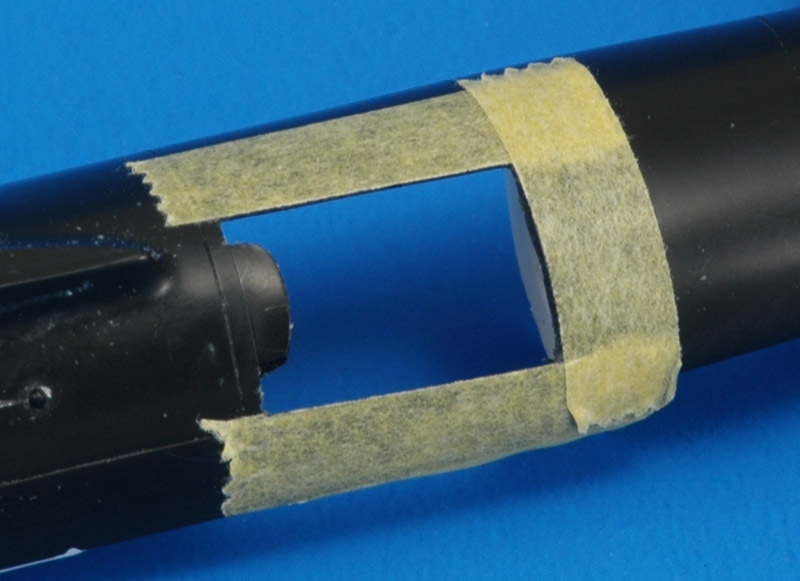 I assembled the parts with a tapered strip of plastic between them, just like the U-2A inlets. You can vaguely see that strip in the photo above. Looking back, the amount of widening is still not enough. Next I scraped and sanded the bulges off, creating the 'interim' U-2C inlets, seen on the left. When I installed the inlets on the fuselage I noted that adding a wedge-shaped filler wasn't the right answer, since the fit against the (much reduced) bleed slot wasn't very good. I should have added a strip between the inlet parts. Instead I added inversely tapered strips of plastic card to the fuselage, at the upper and lower edges of the inlets (just visible two photos above). I used Milliput and Tamiya putty to make smooth inlet interiors, and painted it yellow in preparation for a chromate yellow interior. Later I changed that to 'quasi-infinite' inlets by filling the rear of the inlets with Apoxie, and creating a rounded and blended shape from the front. I'm doubting the color choice now, though. And I found out later that the Airfix U-2 inlets are a bit wider (shown on the right), and they would have been a better starting point. In 2019 I learned on Hyperscale (AFV Club;s U2A/C Intakes?) that the U-2C inlets were approximately 32" in height and 20" wide, or 11.3 by 7.1 mm in 1/72 scale. Mine are 10.7 by 5.2 mm, so I need to widen them especially. I was afraid that the long wings would crack the fuselage joints one sad day, when the model would fall or get bumped. Therefore I decided to reinforce the fuselage in the wing area. The first reinforcements are similar to frames or bulkheads in a real aircraft. I made 17.5 mm diameter discs of 1 mm plastic card, and installed them in both fuselage sides, in such a way that they would overlap during assembly. I plan to use epoxy glue to bond the discs together. 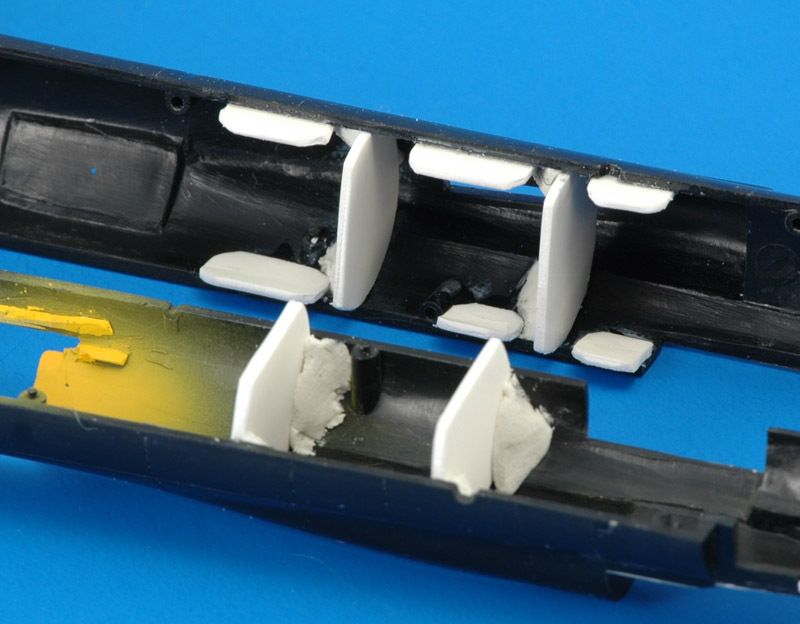 The second reinforcements are plastic tabs to reinforce the glue joint of the fuselage halves. The kit has a strange cone-shaped exhaust. I later removed the cone-shaped area with knives and sandpaper. I still don't know whether the exhaust runs up to the edge of the fuselage, or whether it ends about 20-30 centimeters inside the fuselage. On the U-2R it ends inside the rear fuselage, but I still haven't found a good photo of the first generation U-2. Aerofax pages 83 and 120 show something but not all of two U-2C exhausts. Judging from the frame internal diameter, the engine exhaust has exactly the diameter of the rear fuselage opening. The U-2A exhaust appears to be smaller, judging from the photo on page 39 of 'Remembering the Dragon Lady'. 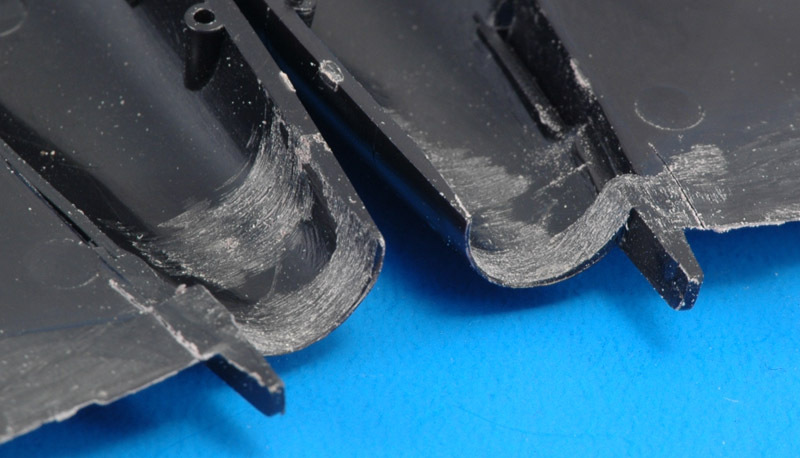 N803X clearly has an extended rear lower fuselage part ('sugar scoop'), shielding the engine exhaust. This shouldn't be too difficult to add. The Aerofax book has the fuselage station numbers of the extension. Note that two versions of the sugar scoop existed. I used a Dremel sanding cilinder to grind out all the excess plastic of the exhaust area. I cut a 65 mm section of K&S Engineering 3/8" x 0.14" (9.5 x 0.36 mm) brass tubing. This was the largest size tubing that would fit inside the Academy rear fuselage. It is supported by a plastic bulkhead just ahead of the tail wheel well. 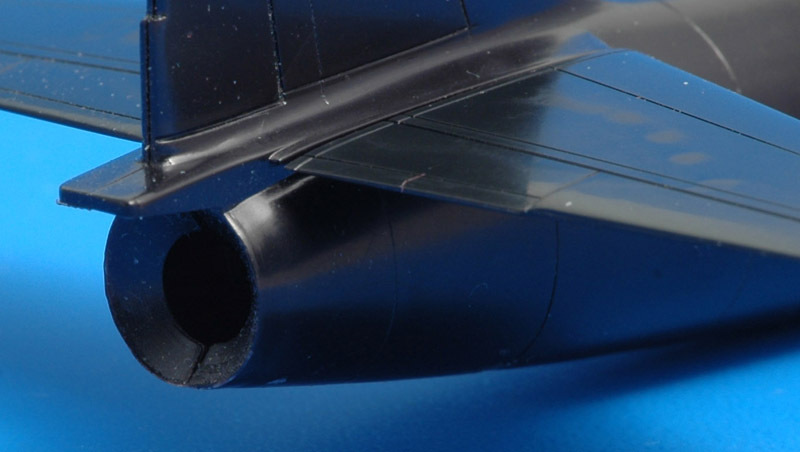 I also looked at the Cutting Edge 1/48 exhaust, but since it represent both the J57 and J75 powered versions, I don't think it's very accurate. Another issue to be sorted out is whether the U-2A and U-2C versions had different rear fuselage lengths, most likely because of the larger diameter of the U-2C's J75 exhaust. I *think* I see it in most photos, but I'm not 100% sure. In an Airfix Lockheed U2 thread on the Airfix Tribute Forum it is also mentioned by poster 'rantingpedant 1'. 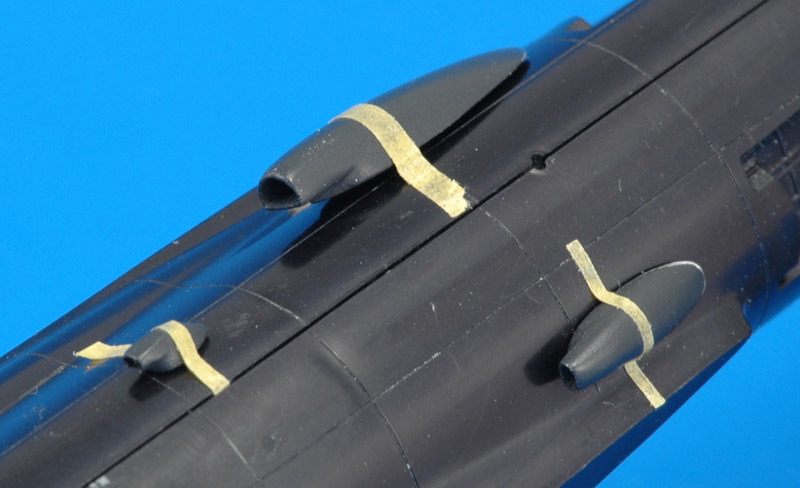 There's some indirect proof: in 1/48 scale, the Hawk U-2A and the modified Testors U-2C have different rear fuselages I clamped the fuselages of these two models together (see photo), and established that the Testors fuselage was 3.5 mm shorter. Similarly, Cutting Edge set CEC48287 'U-2A Conversion' contains a longer rear fuselage to be fitted to the Testors model. The last question is what fuselage 'type' the Academy/Seminar kit represents. I haven't decided yet. One more data point is this photo of a 'Pave Onyx' U-2C fitted with the 'Advanced Location Strike System'. It was photographed in nearly perfect side view, showing that the rear edge of the fuselage concides with the trailing edge of the horizontal tail (or elevator) at the root. It also coincides with 45-50% chord of the rudder. Not surprisingly, the long and thin wings present some problems. Cut from the sprues they have a slight S shape in front view, due to warpage. However, they weren't too difficult to assemble correctly. First I glued the small insert in position, that closes the slipper tank opening. The inserts fit pretty well, although others reported quite some problems. I filled the gaps with superglue. Next, I test fitted the large lower wing insert. These required some shaving to sit perfectly flush. Then I taped the upper wing upside-down to a stiff panel, and pulled the mounting tab down with more tape to make the wing's upper surface completely straight. With the part taped down like this, I glued the insert with super glue. The result: one perfectly straight wing. The wing does not return to its earlier S-shape, since the combination of upper and lower wing now makes a rigid 'beam'. The thus assembled wing does have a few problems. Firstly, the leading edge is fairly rough, and it required several applications of super glue and sanding. Secondly, the wing parts have some sink marks. Just outboard of the lower wing insert, the wing has sink marks on both upper and lower sides. More difficult to solve are the (rather shallow) sink marks all along the forward part of the flaps. These sink marks give the wing a rather unnatural profile, and I think it is essential to remove them. Thirdly, the trailing edge is rather thick. I measured almost a millimeter there! Some serious sanding was required there, but now I have a nice looking wing I think. I filled the holes for the wing supports, but left the hole for the pogo gear open. After all this sanding, I added the tip skid. It's fit was not so hot, and lots of superglue was used to fair it into the wing. I sanded the skid to about half its thickness, which makes the skid look much more realistic. Between the flaps and ailerons, Seminar moulded a raised strip, which was removed during the sanding of the trailing edge. I think this strip is a bad attempt at simulating the fuel dumps on both wings and an infrared / ECM antenna fairing on the right wing, according to drawings and photos. But many photos, including my photos of N803X, show nothing installed there. I will therefore leave the wing's trailing edges clean. And after working hard to achieve perfectly straight wing, I decided I wanted bent wings, as all U-2s have when at rest. Working slowly with a small hair dryer, I gave the wings about 4 millimeters of droop. I still have to check with a taped-together model whether this is sufficient. After all the work on the wings, I painted one in Revell 9 coal black. It is shown with the other wing still in the process of sanding and rescribing. It was satisfying to hide all the work and crimes under a nice coat of paint. Since my U-2 will be pretty boring with regards to details, I decided to do some extra work on the speedbrakes. The detailing of the speedbrake wells is not bad, but I wanted a more three dimensional look. I decided to build completely new wells, starting with a 9 millimeter wide three wall box. In the middle I added a vertical frame using two pieces of strip. Splitting the area left and right of the frame are vertical stringers. Lastly I added a horizontal U-stringer made by folding 0.005" card around an X-acto blade. I painted the wells in Humbrol's RAF trainer yellow, searching for a better chromate yellow match in the mean time. What remains now is some hydraulic tubing and the speedbrake hydraulic jack. The speedbrakes will probably also need rebuilds. To make room for the speedbrake, I cut away all the plastic up to 0.5 mm outside the outline of the original speedbrake. Tamiya tape was used to define the area to be cut away. Here's a rough fit of my scratch-built speed brake well, place too far aft. The J57 powered U-2A had a single large oil cooler inlet on the right side of the fuselage. On the J75 powered U-2C, this inlet moved to the left side, and a small oil cooler inlet was used on the right side. There's a third and smaller air inlet on the bottom of the fuselage, slightly offset to the left of the centerline. Luckily Seminar provides the two largest inlets, but the shapes and dimensions are not very accurate, and the placement instructions are not completely correct. I decided to build new inlets. 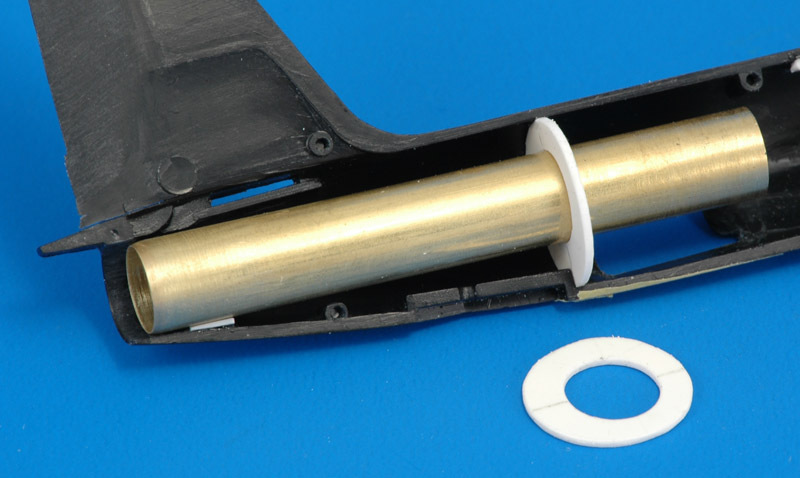 Construction of the largest inlet started with a piece of 3.5 mm tubing, cut off at the bottom and mounted on a curved piece of plastic card (matched to the fuselage curvature) and a first application of Apoxie. It is very rough at this stage. Here's are the three inlets again after more refinement. I used a 2 mm brass tube for the medium sized inlet, with the edges thinned down and the shape made slightly oval. For the smallest inlet I used a piece of 1.5 mm Albion microtubing, pressed slightly flat, to make an oval opening. The rest of all inlets was sculpted with Apoxie putty. More sanding, painting and sanding slowly improved the shape and surface quality of the set of inlets. Here's the results with a layer of black. I will cast a resin set, for use on other U-2 models. It starts to look like the resin set that Norm Dubay created for his Airfix model. To align the inlets on the fuselage, I retained Academy's alignment pins, and drilled a corresponding hole in the base of each inlet. I added a further alignment pin for each inlet, on the panel line in front, but offset 1 mm to the right. I drilled 1 mm holes and installed a piece of stretched sprue, shortened until it resembled the existing pins. Of course the inlet parts got a corresponding alignment hole. The largest of three intakes was angled downward slightly. Last step was to cast resin copies of the masters. They turned out very nice, if I may say so. Scratchbuilding in combination with resin casting can be a lot of fun! 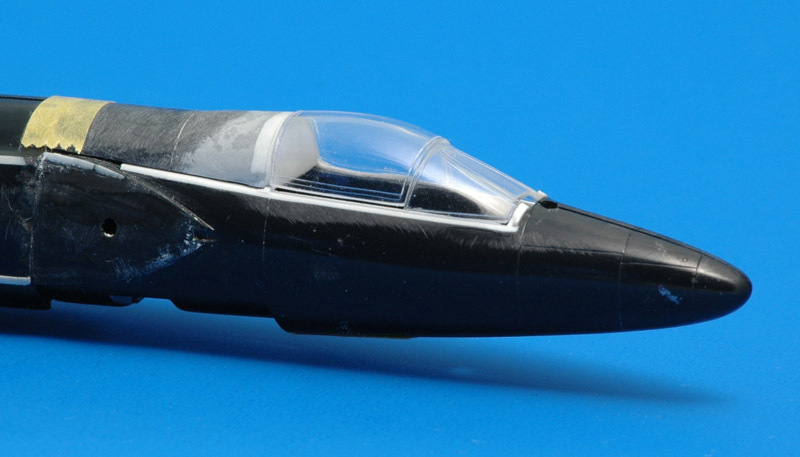 Here at last: the former Cobra Company, now Lone Star Models U-2 cockpit set. It is beautiful! I worked a little on the fuselage so far. It has sink marks near all the position pins, which require filling. The spine fairing behind the canopy has a continuous slope, which is not correct. I made a kink in the middle, so the rear half runs horizontal. This gives the whole cockpit area a slightly bulged look, which appears more realistic to me. This U-2 page has a unique lower fuselage photo. It seems there is no 'fold' leading from the boundary layer slot down to the trailing edge of the wing, like the model has. It looks like some Milliput is required here. The part that forms the lower hatch of the Q-bay has no camera windows at all, which is kinda disappointing for a recce aircraft! Interestingly, all my references up to say 2000 appear to be censored: not a single photo or drawing shows a Q-bay with camera openings, with the exception of two NASA Q-hatches in the Aerograph book. Only in Chris Pocock's latest book clear photos of for example the B-camera hatch are shown. 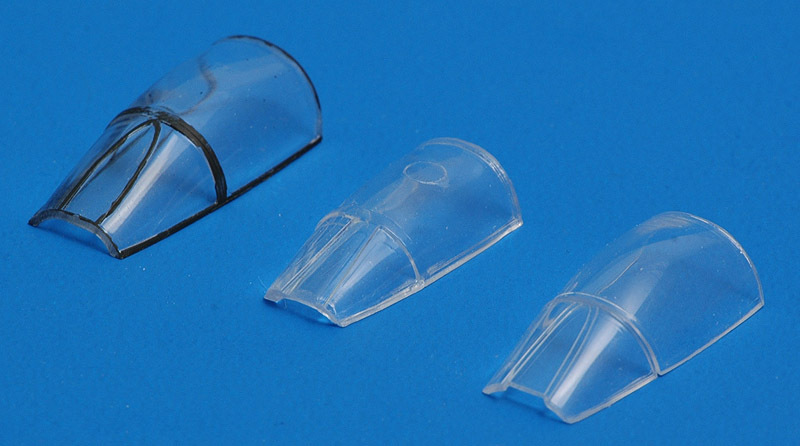 In 1/48 scale, Cutting Edge sells a B-camera Q-bay hatch in resin (catalog number 48-289). It is the type with seven camera openings, of which four are round and three are square with rounded corners. According to the CIA, a jettisonable cover for the camera windows was developed to prevent the windows from getting dirty on wet runways. It was released at the same time as the pogos so that it could be recovered and reused. Since the Q-bay hatches are matched to different camera systems, it is interesting to note that the A2 camera was used in overflight of the Soviet Union. The trailing edge of the rudder is horribly thick, as can be seen in the exhaust photo. I scraped the rear half of the vertical tail much thinner, and made a sawcut below the rudder to allow the thinned edges to meet each other. I guess I took out about one millimeter of thickness! The airco outlets are absent on the model. I had read numerous discussion on rec.models.scale about the colors of U-2s and SR-71s, and often a black with a weak blueish hue was mentioned. I was planning to paint my bird in a blueish black color, but I had to change the plans after consulting the relatively new sources. A downloadable PDF-version of The CIA and the U-2 program, 1954-1974 also reports that a dark blue color was chosen for CIA U-2s after tests (page 149). 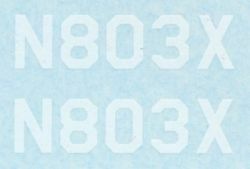 The instructions of Cutting Edge decal sheet 48-152 report the color was FS 35042. The Chris Pocock book 'Towards the unknown' has a definitely blue U-2 on the cover, and also mentions FS 35042. USAF U-2s never wore this color, they used a pure black. This photo on the Cold war black projects site shows definitive proof of the blue camouflage, showing both a black and a blue U-2. Further proof was provided by Tim Bradley, who posted on the Hyperscale forum a statement of someone who worked on the CIA U-2s in Taiwan: I have copies of these CIA papers, SB329, dated 8/29/58 and SB592, dated 11/9/61. Both list the paint as 'Lacquer Color Sea Blue ANA 607 18 Gal., Zinc Chromate Primer 5 Gal.' (SB being short for service bulletin). I was afraid that 35042 would be too blue for modelers like me, too big of a shock. While building the model, I experimented to establish the best color to use. I first tried a 1:1 mix of 15042 and satin black (Humbrol 181 and 85 respectively), but this turned out to be almost purely black. Next was a 3:1 mix of Humbrol 181 and 85, which looked rather blue. Perhaps it looks better with a flat clear painted over? To be continued. 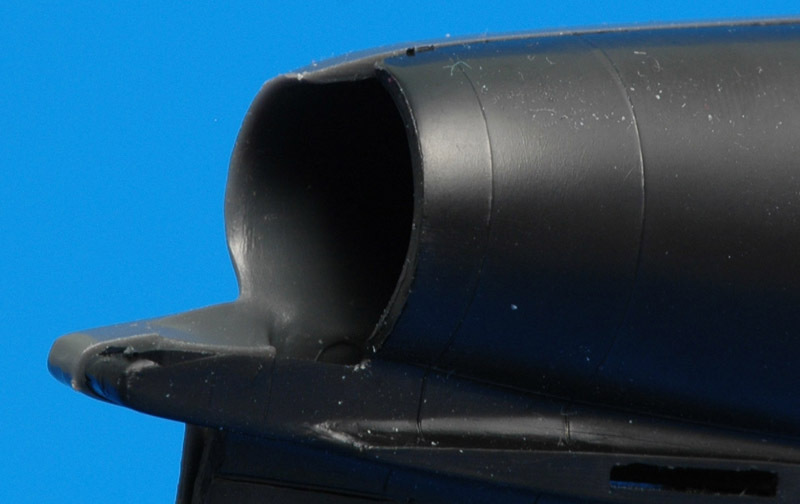 The speedbrake wells of N803X appear to be chromate yellow, a color also seen on other all-black U-2s. Most likely the inlet interiors are also in this color. These yellow parts will make quite a bold contrast I think! The cockpits of early U-2s were painted interior green (at least side panels, the control yoke, rear bulkhead, canopy sill). Later models had painted medium grey cockpits. But even a recently used NASA U-2C had a partly green cockpit. Basically everything including and above the top longerons was green, the rest grey. The seat appears to have been grey in all aircraft. 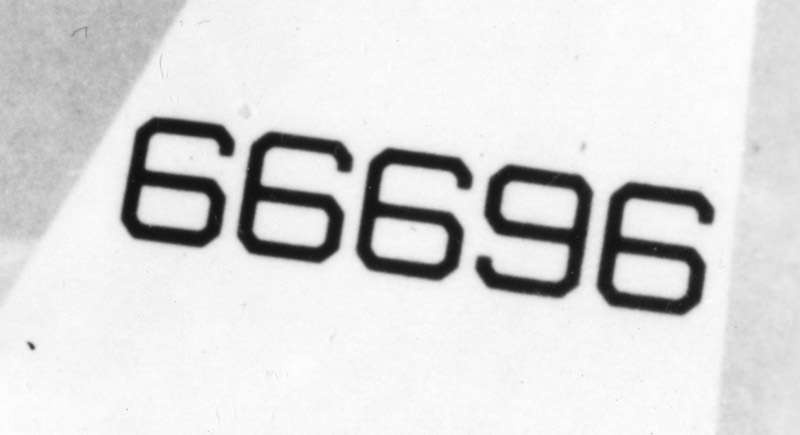 I had the white serial numbers printed on an Alps printer. Rescue and walkway markings remain to be made or found. Rescue markings from an F-104 appear to be identical to those on the U-2, which is not surprising. The following does not apply to my own model, but could be of general use. I was always puzzled by the Navy style serial numbers on early bare-metal Air Force U-2As. Why would Lockheed do the 'U.S. 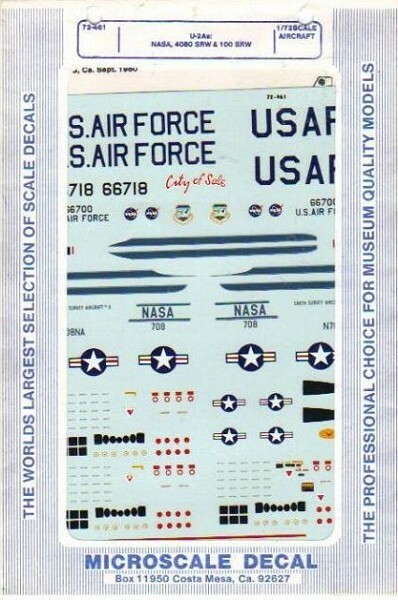 AIR FORCE' markings in the correct USAF-prescribed font, but use (what I perceived as) the Navy font for the serial number? In 2018 I noted that there were quite a few air force aircraft with this type of 'Navy' font lettering and serials, like the H-43B and the A-1E. A still from an A-1E film clip was a breakthrough: I saw the font was subtly different. I redesigned the Navy font and found a much better match, see here. 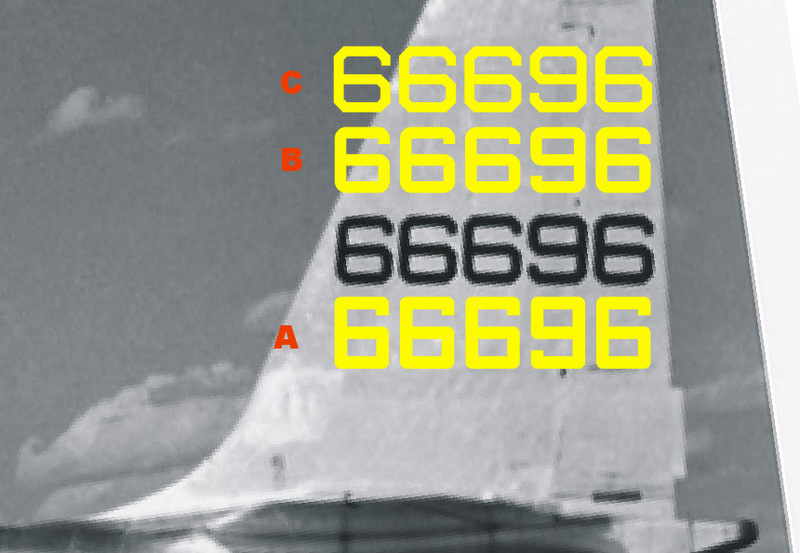 That made me decide to look again at the U-2 serial numbers. First I tried the A-1E-style number, with a height-to-width ratio of 6 to 4.5 and a radius of half the stroke width. Next I designed another version, with a height-to-width ratio of 6 to 5 and a radius equal to the stroke width. Both are shown here. I overlaid the photo with these two fonts, and concluded that the second version (B) was closest. It's still not a 100% match though, if you ask me. But I think a few decal sheets have to revised now! Following negative comments on the rounded numbers, plus the uncertainty of the pixelated image of 66696, I tried a '45 degree' style lettering, but on a 7 by 6 square grid. 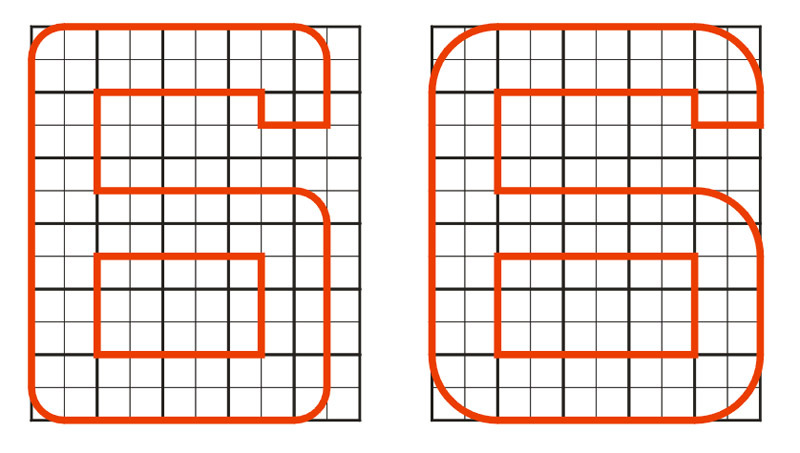 The USAF lettering (left) has a 6 x 4 grid. The latest try (C) doesn't look bad, but the picture is too pixelated / grainy to be 100% sure. To be investigated further. The answer came quick, when I was sent a hi-res version. The photo was not a first-generation print, but still it showed clearly 45 degree corners. I think some sort of overexpose (notice the color of the tail itself) also made the stroke appear a bit thinner than in the print above. 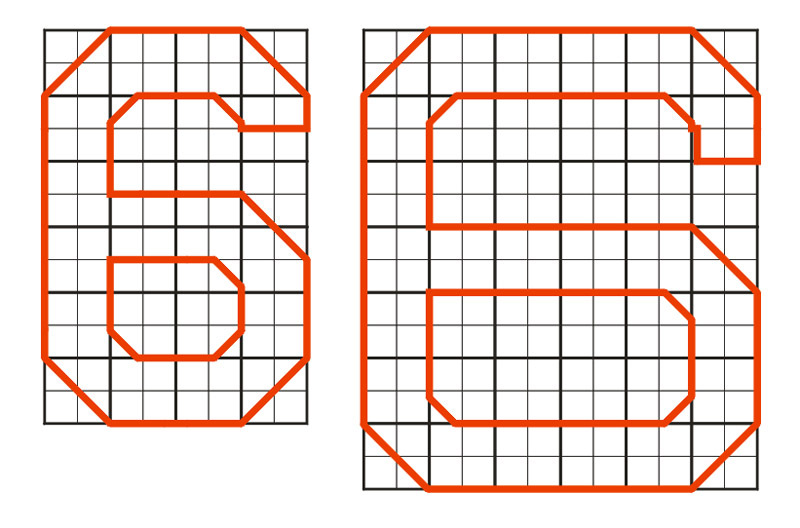 The conclusion is that the lettering is based on a 7x6 grid with 45 degree corners. How Lockheed arrived at that type of lettering is the remaining question. Possibly there was no Tech Order 1-1-4 or equivalent at that point? Cockpit set for U-2A/C aircraft by Cobra Company, mastered by Scott Battistoni, issued in 2012 or 2013. Review on Internet Modeler. Reissued by Lone Star Models in 2017. U-2 external update set by Cobra Company. Reissued by Lone Star Models in 2017. In 1/48 scale, much more was available. Cutting Edge had an extensive line for the first-generation U-2 with twelve resin sets. Seven were discontinued in July 2006, the rest in February 2008 when Meteor Productions / Cutting Edge production was stopped. They are listed here because they can serve as inspiration for 1/72 scale. CEC48299 'U-2C/F 'Interim' Seamless Intakes'. Applicable to all U-2Cs before 1965. These intakes are significantly different from the 'coke bottle' intakes in the Testors kit. CEC48325 'U-2C 'Flat Spine' Conversion'. 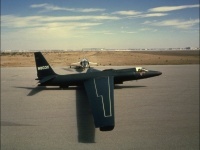 All U-2Cs were built with the flat spine; the long dorsal canoe was not installed until late 1965. In 2013, Norm Dubay started offering a resin 1/48 scale Powers' U-2 conversion set, with U-2C interim intakes, three cooling scoops, a Q-bay hatch for the B camera, and a flat fuselage spine. 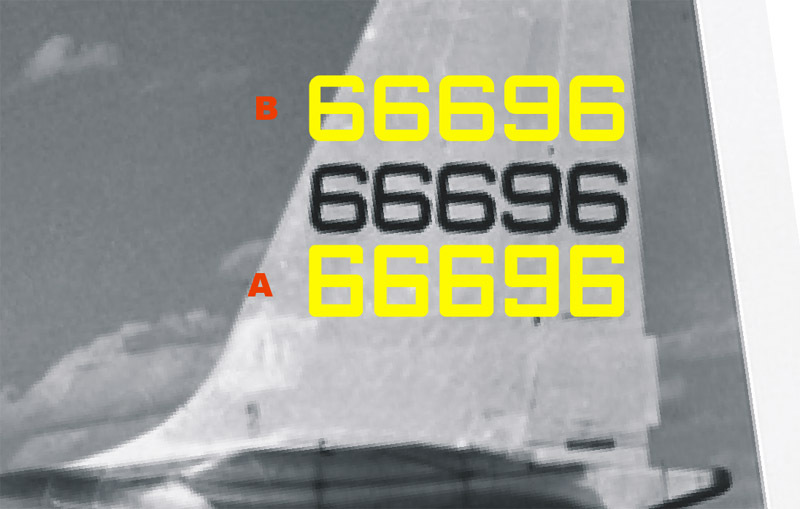 In 2016, Caracal Decals issued a 1/48 scale U-2A/C Dragon Lady decal set (CD48118), with ten marking options, stencilling and common markings, plus half a sheet full of serial number digits. 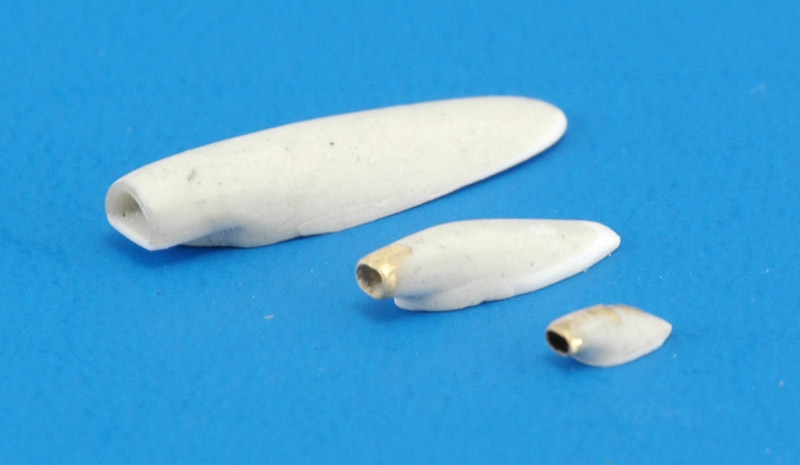 In 2018, Lone Star Models showed 1/48 scale "Coke bottle' intakes under construction. I found a few photos that illustrate the inlet issue fairly clearly. Jay Miller's Aerofax 'Lockheed U-2', page 56, has a photo of a U-2 approaching a tanker, Jay Miller's 'Skunk works', page 77, shows a U-2 on the tanker's boom. The former clearly shows the original small inlets, which cause a kink in the fuselage sides just ahead of the wing leading edges; the latter clearly has the enlarged but non-bulged intakes, and a continuous curve of the fuselage sides. 'Lockheed Blackbirds' by Thornborough and Devies, page 32, has photos of two U-2Cs, the upper with bulged inlets, the lower with straight inlets. N803X as seen in the photos below has the interim large inlets, best seen in the first photo below, and also in the one-but-last photo. 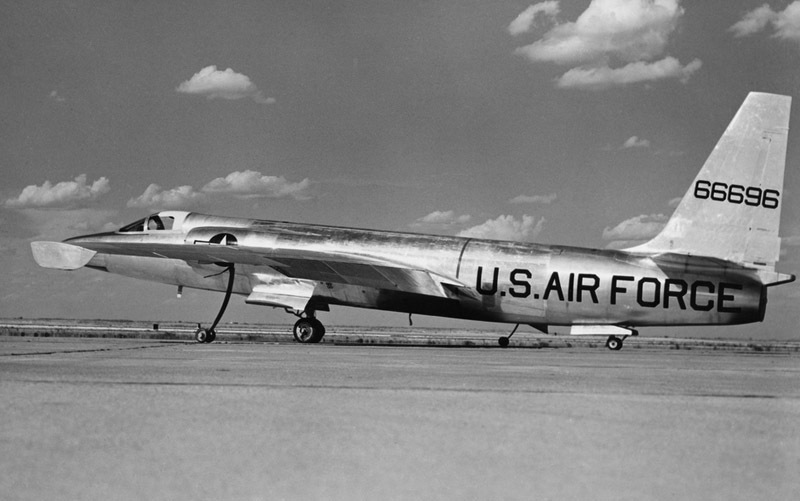 Lockheed staged a photo session with Kelly Johnson and Frank Powers, using U-2C N803X, and an F-104 in the background. I found five different photos of the shoot. The only color reproduction was found in 'A-12 Declassified'. 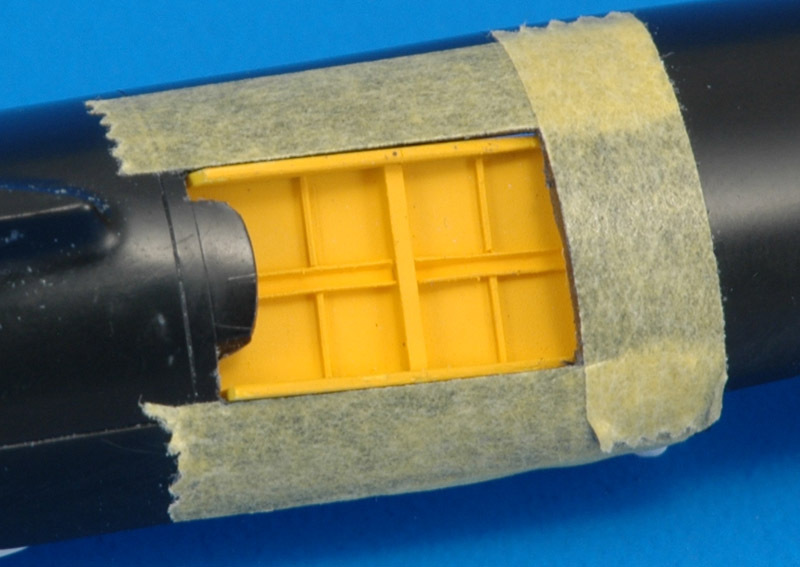 It clearly shows that N803X was painted dark blue instead of black. Johnson's suit is not a bad match for the color! :-) The photo clearly shows the large U-2C inlet of the non-bulged type. The second photo comes from the Aerofax book (page 19), showing Johnson posing with his creation. Note the F-104 in the background as in the first photo. Outlets just left of Johnson's face are probably airco related. The elevated view shown below probably shows N803X after the Johnson/Powers photo shoot, moved forward a few meters. The walkway lines appear to be white or perhaps gray, with red 'NO STEP' markings (hardly visible, but they are there). 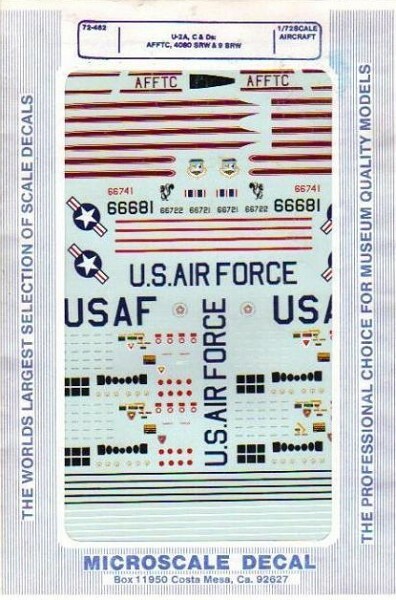 A Cutting Edge 1/48 decal sheet also appear to have white walkway lines with red 'NO STEP' markings. N803X had no red turbine warning stripe. 'U-2 in action', page 20, has this photo of Johnson and Powers posing a conversation. Since Powers was held prisoner some 18 months after his 1 May 1960 shoot down and released in February 1962, and the aircraft crashed in November 1963, the photos were probably taken in this time slot. William Wagner's 'Lightning Bugs' (page 1) has a photo with a slightly different angle. Pogo gear has a 'remove before flight' tag attached. Another shot of N803X, showing its right side. Antenna wire just visible. I think I see several 'Remove before flight' tags attached to the aircraft's landing gears. And yet another one, after landing on the taxiway. The large inlets can be seen again in this view. This photo, published on the cover of 'The U-2 Spyplane - Toward the Unknown', was made with an unidentified U-2 fitted with slipper tanks. Again it shows a nice dark blue camouflage color. Note the orange-red pogo. The last photo strongly appears to have been made on the same occasion (note for example the position of the sun), and identifies the aircraft as N800X for what it's worth. The camouflage color is undeniably dark blue. Chris Pococks' "50 years of the U-2" is the first reference that puts dates/years on airframe modifications. I'm adding them here as I find them while reading. Norm Dubay shows a different 1/48 U-2A build on Hyperscale's Plastic Pix: 34 years in the making, 34 Years in the making...U-2A Part 2 and 34 years in the making.....U-2A FINISHED! Jan Forsgren shows his Testors 1/48 USAF U-2A conversion on Hyperscale in part 1	and part 2. Jan discovered that the wing roots are not aligned in height, left and right. I checked it on an old Hawk model, and indeed found an 0.6 mm difference left and right, using the front edge of the wing tab slot as a reference. With the fuselage 43.5 mm wide there, this gives an 0.8 degree angle if you stick something through both slots. One degree is quite noticable to the eye, and a quick check with the model confirmed this.